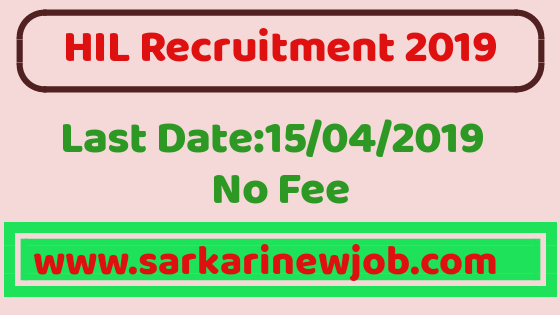 HIL Recruitment 2019 | Trainees | BE/B.Tech/MBA/Any degree | NO FEE ( free ) - Sarkarinewjob.com A ultimate job portal to provide employment news. · 3 years for OBC candidates. · Others as per Govt rules. How to apply for HIL Recruitment 2019 for Trainee? All interested and eligible candidates can download the application form and send duly filled application form along with required documents (attested copies of certificates, testimonials and recent passport size photograph) to the following postal address on or before 15 April 2019.